Fig. 1 Bacteria swim via flagella rotation. The bacterial flagellum is a several micrometer long filament which bacteria use for swimming. The flagellum consists of a base, filament and cap. In the base, which binds the flagellum to the bacterium, a proton gradient driven motor rotates the filament helically for propulsion. The cap is explained below. Movie provided by Namba Protonic NanoMachine Project. Fig. 2 Four domains of flagellin. Fig. 3 Flagellum is built from helically stacked flagellins. Domain D0 (blue) comprises the channel which confines translocating flagellin (magenta). The flagellum [Namba et al. (1989)] is built from repeating flagellin monomers which stack helically. Each repeat of 11 flagellin monomers adds 52 Å to the length of the flagellum. Flagellin (Fig. 2) has four domains, D0 (blue), D1 (brown), D2 (red) and D3 (gold), which represent distance from the center of the filament. 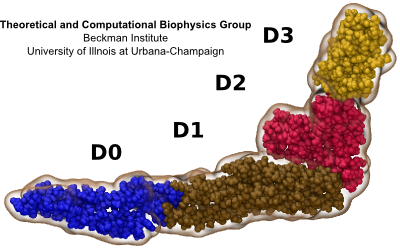 Domain D0 is the inner most domain and comprises the inner surface of the flagellar channel (Fig. 3). This channel, only 20 Å in diameter, is so narrow that it only conducts unfolded flagellin. Fig. 4 Cap assists flagellin to fold into place at tip. Movie by Namba Protonic NanoMachine Project. Fig. 5 Self Assembly. Flagellin is pumped into channel at the base and translocates to tip where it folds into place, thereby elongating flagellum. At the base of the flagellum, a type III secretion system pumps unfolded flagellin monomers into the flagellum's central channel. Each flagellin pushes its distal neighbor toward the tip. When a flagellin reaches the tip, the cap protein [Maki‑Yonekura et al. (2003)] helps it to properly fold into place, thereby elongating the flagellum. The filament growth rate, V(L), which depends on filament length, is known to decay exponentially with length according to V(L) = V0 exp(-L/a) , where V0 (roughly 9 nm/s) is the growth rate of nascent flagella and a (roughly 3.7 μm) is the exponential decay length [Iino (1974)]. Our research explains how structural biophysics, theoretical modeling and molecular dynamics simulation combine to explain how the physical properties of the flagellin translocation system cause the flagellum growth rate to exponentially decay with length. Fig. 6 Forces on segment of translocating flagellin: proximal neighbor pressure, distal neighbor pressure, friction and channel confinement. The rate at which the flagellum grows stems from the rate at which flagellin monomers can translocate through the confining channel. The rate of translocation depends on properties of the pump, cap and flagellin/channel friction interactions. Though these processes and interactions are very complicated, our simplified model of flagellin translocation gives a correct, and very clear, understanding of the translocation and growth process. We use known system properties to derive relationships between these flagellin properties then derive the filament growth rate. These system properties are cast as biological conditions neccesary for the theoretical model to apply; thus, even a non-flagellar system which obeys these conditions can be described by the equations derived below. Fig. 7 Simulating confined flagellin. Two types of simulations were performed of flagellin confined to a cylinder; in both, a segment of flagellin was cylindrically confined by a spring-like force to a specific radius. The axial force (black) differs between simulation types. During these simulations, pressure, density and friction contacts are measured. Equilibration. The position of the harmonic forces which axially confine the flagellin remains fixed during the simulation. Several biological conditions in the flagellum combine to setup a boundary value differential equation which can be solved for flagellin pressure as a function of positions. Additional conditions allow the remaining flagellin properties to be derrived from flagellin pressure. Fig. 8 Isotropic pressure. 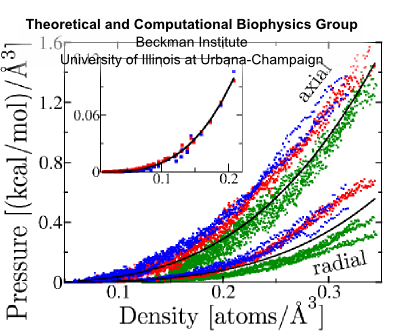 For equilibrium simulations (Fig. 7) at several channel radii and lengths, radial and axial pressure are equal. Flagellin pressure, p, is isotropic. Refering to Fig. 6, radial pressure (up/down white arrows) which an unfolded flagellin exerts against the channel surface (magenta) should be equal to the axial pressure (left/right white arrows) which the flagellin exerts on its proximal (gold) and distal (red) neighbors. Justification We expect that a denatured protein, a self-avoiding but otherwise rather flexible polymer, possesses this property typical for a fluid and does relay compression, exerted on it axially, also radially (Fig. 6). Molecular dynamics simulations of flagellin confined in a cylinder (Fig. 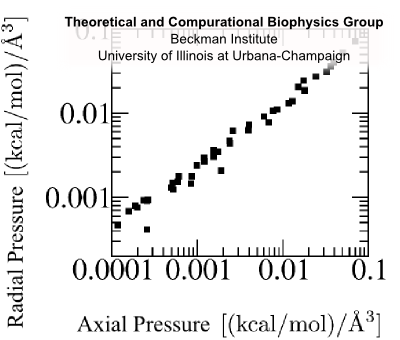 7), allowed measurement of radial and axial pressure; comparison (Fig. 8) shows that the pressure of a denatured flagellin monomer is isotropic. Fig. 9 ftip derives from the force required to push a flagellin past the cap protein then fold into place. Flagellin pressure at the flagellar tip is ftip/πR² where ftip is the force with which flagellin has to push past the cap to exit the channel (Fig. 9); this force is flagellum length independent. Justification Because translocation is so slow, it is quite reasonable that flagellin is able to sample all of its local conformations and remain in equilibrium during translocation. Flagellin pressure is a power law function of density. This relationship bears the form p = γ(ρ/ρ0)β For β = 1 this ammounts to the ideal gas law; for proteins with additional inter-atomic forces and chemical bonds, we expect β > 1. Justification Modeling unfolded flagellin in the flagellum as a Gaussian chain confined to a cylinder, the pressure density relationship is described as p = c1ρ + c2ρ³ where the second term is 1-2 orders of magnitude larger, giving p = γ (ρ/ρ0)³. Simulations of flagellin being compressed in cylinders confirms that β ≈ 3 (Fig 10). Fig. 11 Flagellin translocation simulation. Click here for movie. We see here that the maximal length of the flagellum depends only logarithmically on fstall, and it depends linearly on the coefficient translocation friction, α. 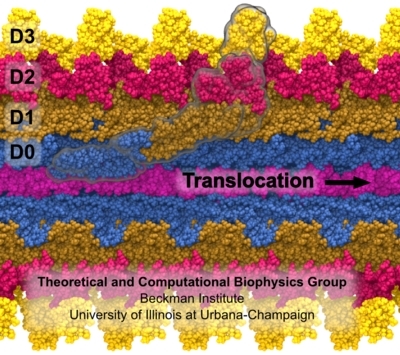 Future simulation and exploration of flagellin translocation will give further insight into the nature of translocation and friction and their dependencis on the channel structure. Theoretical and computational investigation of flagellin translocation and bacterial flagellum growth. David E. Tanner, Wen Ma, Zhongzhou Chen, and Klaus Schulten. Biophysical Journal, 2011. In press. Page created and maintained by David E. Tanner. Contact Us // Material on this page is copyrighted; contact Webmaster for more information. // Document last modified on 28 Jun 2011 // 18279 accesses since 06 May 2011 .